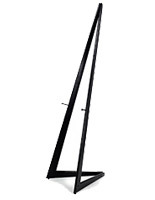 Standing easels are great sign holders within theater entrances, retail stores or school auditoriums. 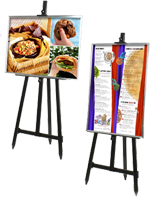 This presentation easel, standing easel can be used in both casual and upscale environments, for welcoming audiences to your establishment or for communicating sale prices and new products. These display easels, also known as bi-fold wooden easels, pair a beautiful black-finished, oak tripod with a black, snap-open frame. These wooden easels, standing easels feature quick-clip frames, for effortless graphic changes. Simply flip open the hinged edges and insert your posters! 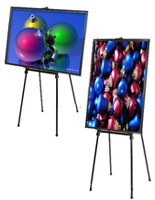 The included snap frames fit standard-sized 24"w x 36"h posters and can be positioned either vertically or horizontally on the tripods. 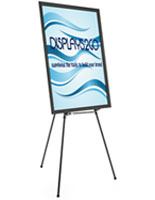 We even provide these display easels with clear, non-glare lenses to protect your graphics from damaging factors. 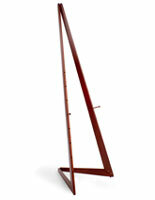 Display easels, such as our presentation easels, feature an adjustable tripod as well. Change your sign holders' presentation height by moving the provided pegs into any of the (5) peg holes. 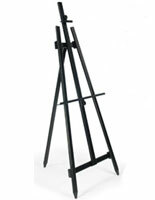 These bi-folding wooden easels are sturdy display easels, with their rubber non-skid feet. Feel secure in knowing your stands will stay in place, withstanding typical foot traffic in any indoor environment. 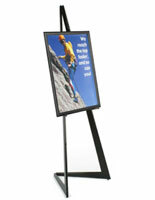 Standing easel is a unique sign holder, unlike any presentation stands or fixtures!